Pittsburgh Public Schools already is on track to revamp its career and technical education program for high school students. Now there’s a proposal for students in third through eighth grade. At the school board’s education committee meeting tonight, Angela Mike, the district’s executive director of career and technical education, will present a plan to provide all students in grades 3 through 8 once-a-month lessons about careers and work. The plan is expected to be up for a board vote next month and, if approved, begin in the second semester of this school year. “Students already are starting to think about careers at a younger age,” said Ms. Mike. Pennsylvania requires career education for all students and sets academic standards for grades 3, 5, 8 and 11. Pittsburgh is working on developing a curriculum for students in kindergarten through grade 2 as well. If approved, that may be in place next fall. The first lesson in third grade is aimed at helping children identify their own personal interests, including a survey asking, among other things, whether they like math, taking things apart and managing money. The next lesson helps to identify the range of jobs available. The third helps children understand that careers take preparation. By grade 8, students are writing resumes and learning interviewing skills. Eighth-graders already have a requirement to complete a career portfolio. One lesson to be demonstrated to the board uses materials from the Pittsburgh History and Landmarks Foundation, such as a piece of slag to talk about how the steel industry has changed. The Foundation is among the more than 50 partnerships the district has set up as resources for students, including speakers, internships and tours. Plans call for students in grades 4 and 7 to take two field trips to businesses in each of those two years. Ninth-graders will be able to spend a day visiting the training sessions for the carpenters, plumbers and electrical workers. At the high school level, the board already has approved the creation of three regional programs — health careers; culinary arts; and information technology and business finance — that will be offered at high schools in each of three regions of the city. Some high schools will have “signature” programs — such as auto body at Pittsburgh Brashear and advanced machine operations at Langley — that require students to attend certain high schools. Most of the programs in this system will be in place next fall. About 700 students are enrolled in high school CTE programs, and Ms. Mike said the district is trying to attract more. The district also is trying to make sure that its programs meet the state standards, including a checklist of competencies for each field and adding meeting not only academic standards but also industry standards. The latter still requires an agreement from the teachers union. Wilkinsburg’s main commercial district on Penn Avenue suffers from a 38% vacancy rate, but a $25,000 grant from State Representative Joseph Preston Jr. to the Wilkinsburg Community Development Corporation is the most recent achievement for the growing two year old organization hard at work to revitalize their community. A great deal of the grant money will be used for promotional materials that will make the transformation efforts in the business district more visible and help visitor’s better identify the borough’s locality. “We’re going to be getting new light pole banners. We’re making a business district map and brochures that we can put online and in print form. We also do a monthly newsletter,” says Tracy Evans, the WCDC’s first full-time executive director, who was hired in June. A major benefit entails the creation of a new WCDC website that will better connect the Wilkinsburg community, visitors, and businesses. According to Evans, the website will likely be up by Spring 2011. Additionally, Wilkinsburg has partnered with TreeVitalize in order to apply for a grant that will allow for 500 new trees to be planted along Penn Avenue. While the grant is still pending, WCDC beautification coordinator Michael Yellets is currently working with local business owners to select the most suitable tree species for various segments of the Penn Avenue sidewalk. BEAVER — Since 1802, this town 35 miles northwest of Pittsburgh has reflected the aspirations of the bankers, doctors, teachers, lawyers and politicians who inhabit its quaint streets and River Road, a lovely stretch of beautiful homes that overlooks the Ohio River. 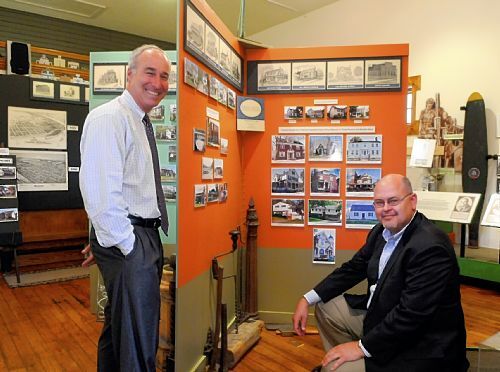 Now, this community’s architectural aspirations are on view in a concise exhibition called “Two Hundred Years of Bricks, Mortar & Charm” at the Beaver Area Heritage Museum in downtown Beaver. Local historians believe that a house built in 1805 and still standing at River Road and Market Street is the town’s oldest structure. Part of the home’s front section was built with hand-hewn logs that are still visible in the basement. The logs may have been salvaged from Fort McIntosh, a Revolutionary War structure built in 1778. Edwards McLaughlin, chairman of the museum’s board of trustees, spent weeks photographing homes all over Beaver for the exhibition, which examines the evolution of design styles in 50-year periods. His volunteer work correlates to his day job because he’s a partner in the real estate firm Bovard Anderson and a fourth-generation owner of the business. With its 19th-century-style street lights and restored storefronts, Beaver retains its Victorian-era look. So it’s no surprise that from 1850 to 1900, plenty of Colonial Revival, Queen Anne and other Victorian-period homes were built. There’s also a smattering of Italianate, Gothic Revival and Romanesque homes. Surveyor Daniel Leet laid out Beaver, creating four squares in the center of town and four at its edge. Each one is named for a prominent resident or military leader. Agnew Square, for example, is named for Daniel Agnew, who was chief justice of the Pennsylvania Supreme Court. At Third Street and College Avenue, an exact replica of the clock tower that adorned the 1877 courthouse stands on the southeast corner. A new century dawned and tastes changed between 1900 and 1950. As a result, Beaver has examples of English Tudor, Craftsman bungalows and Art Deco designs. There are even examples of Prairie-style homes, a Frank Lloyd Wright design ideal that emphasizes an open floor plan, horizontal lines, shallow roofs with broad overhangs and banks of casement windows with art glass. 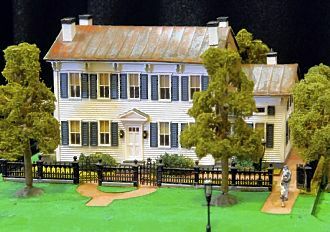 The exhibition features an excellent model of Beaver’s 1877 courthouse plus a replica of the Agnew Anderson House. Both were made by Robert A. Smith. Mr. McLaughlin is just one of several hundred volunteers who combined their collective, considerable elbow grease to transform a former Pennsylvania & Lake Erie Railroad freight house into the Beaver Area Heritage Museum 12 years ago. The building was a shambles with holes in the ceiling, thick grime on the floors and a basement packed with old dust. Now, the museum sparkles. 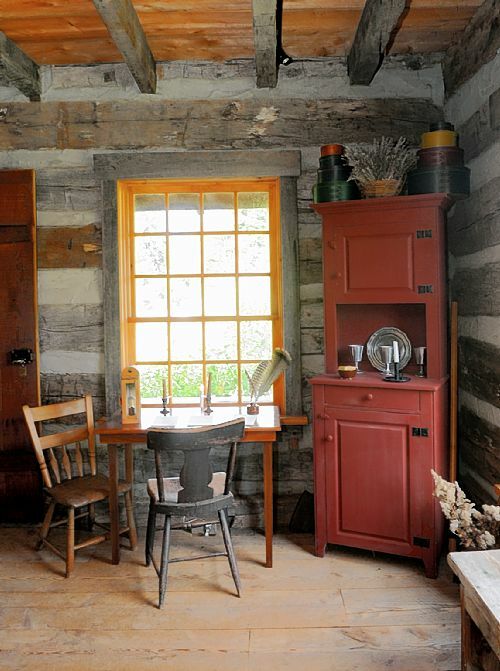 There’s a permanent exhibition about the Beaver region, an outdoor vegetable and herb garden with native plants and an 1802 log house that’s a replica of a frontier home. Mildred “Midge” Sefton, a retired home economics teacher, oversees the volunteers, who meet regularly on Thursday mornings in the basement to accession, catalog and log onto a database each artifact and document that is donated to the museum. Judy Reiners of Beaver recently finished compiling family documents that belonged to Adolf Mulheim, proprietor of a wallpaper and carpet store from around 1880 to the 1930s. Fans will have a chance to buy seats and other memorabilia from the Civic Arena over the next two months through on-line sales. The city-Allegheny County Sports & Exhibition Authority approved an agreement this morning with the Penguins related to the sale of assets from the Igloo, which closed at the end of July. Seats from the arena will go on sale to Penguin season ticket holders in the next few days, a sale that will run until Nov. 30. That will be followed by a sale to the general public on Dec. 1. A pair of seats will cost $495. Buyers can choose from red, blue, black and, of course, orange seats, but they will not be able to request individual seat numbers. About 5,000 seat pairs will be available for purchase. The seat sale will be followed by an online auction Dec. 8 for other arena memorabilia, some of which will include Penguins logos or the signatures of players. Bidding for the memorabilia will start about two weeks before Dec. 8. The highest bidder will be awarded the items. Those who have placed a bid will be notified if they have been outbid leading up to the closing Dec. 8. “Although I don’t like this phrase, it’s very similar to eBay,” said Shawn Allen, chief operating officer for AssetNation, which is handling the sale. The first online auction will be on Nov. 17 for arena furniture. Those who don’t have access to the Internet can call 1-800-303-6511 for a paper bid form. The sale is expected to generate $1.6 million for the SEA and $800,000 for the Penguins, who will donate their share to their foundation. The SEA’s share ultimately could be used to help pay for the demolition of the iconic 49-year-old domed building to make way for redevelopment. 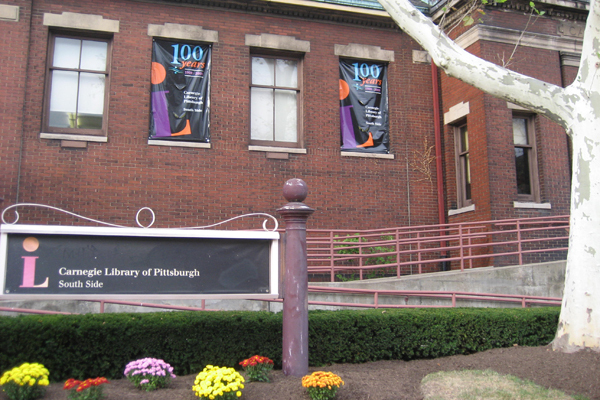 The Carnegie Library of Pittsburgh Board of Trustees has unanimously agreed to make plans to renovate the South Side branch a top priority with funding to come from the Libraries for Life capital campaign that has set aside $2.7 million for renovating the aging building. While the renovation process is in its early stages and an exact date for the project’s completion is currently ambiguous, a community meeting is scheduled at the South Side branch on November 17 at 6 p.m. to hear from the community about what they’d like to see preserved and changed about the library. Karen Loysen of Loysen + Kreuthmeier is the architect for the project and the upcoming meeting marks the start of a public dialogue that will create a vision for the library hoping to satisfy as many people as possible. South Side Local Development Co., one of the most successful nonprofit real estate developers in Pittsburgh, will spend the next 18 months putting itself out of business. The board decided to dissolve the little company whose 28-year tenure on the South Side has coincided with the neighborhood’s transformation in private property values, popularity and market economy. A successor organization with a focus on public issues will be formed with community feedback to the South Side Planning Forum, the neighborhood’s umbrella for other groups, and the Pittsburgh Partnership for Neighborhood Development. Successful development corporations step in with public investment to help neighborhoods attract private investment. Some also have youth and job training programs, public safety committees and other outreach. The South Side nonprofit has largely focused on real estate and has built or renovated more than 100 homes in the past 20 years. Private developers have added some 800. “We’ve done our job,” said Tracy Myers, the company’s board president. In 1982, when the company was founded, property values were two-thirds of the city’s median value, said executive director Rick Belloli. In 2008-09, those values were 170 percent of the city’s median. About 50 percent of the retail space along East Carson Street was vacant in 1982, and that rate is now at about 10 percent, he said. Rob Stephany, executive director of the Urban Redevelopment Authority, said there is still work to be done by a high-capacity real estate nonprofit in the South Side’s adjacent neighborhoods. “The target area is big, and the next step would be moving that [real estate] strength to the next frontier,” including Allentown and Arlington, he said. The city has cracked down on parking violations in recent weeks, and Councilman Bruce Kraus has held several meetings to promote a management strategy for Carson businesses. A neighborhood improvement district is like a business improvement district, except it includes interests beyond those of businesses, such as parks. Participants pay a fee to have the interests of their stated district managed and maintained. The Pittsburgh Downtown Partnership is one example of a business improvement district. A management strategy for East Carson businesses was recommended several years ago by consultants from the International Downtown Association. A committee of the South Side Planning Forum is gathering feedback to determine the range of focus of the successor organization. 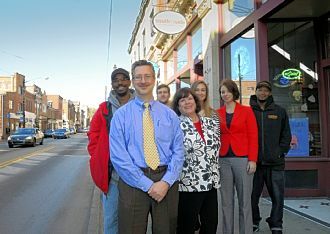 The Pittsburgh Partnership for Neighborhood Development paid for an employee to go door-to-door to gather that feedback. The staff of the local development company will not be involved in the successor agency, although some of its board may be. Ms. Myers said that while winding down, the agency “still has properties and buildings we want to make sure are well cared for. Some entity needs to keep an eye on these things, to protect all the progress we’ve made to improve the physical environment” and ensure that developers follow historic guidelines. Up hills, along tight curves and down into the river valleys, a bus full of local real-estate agents navigated Pittsburgh last week on a tour the Urban Redevelopment Authority put together to boost city home sales. “I just got a whole different perspective,” said Mary Lynne Deets, education manager for the Realtors Association of Metropolitan Pittsburgh, who sold only about five homes in the city during a 30-year sales career. That’s the kind of statistic the URA would like to change. While open to all real estate professionals, the tour was designed to enlighten suburban agents unfamiliar with the city and all it has to offer. Officials hope their upbeat message will hit home, many times over. “A lot of people want a walkable, pedestrian-friendly community to live in with a lot going on. That’s what urban living is all about,” said Kyra Straussman, URA real estate director. Ms. Straussman said the URA ramped up home marketing efforts at Mayor Luke Ravenstahl’s direction about three years ago. In May, the URA launched a Web site — Pittsburghcityliving.com — that pairs prospective home buyers with neighborhoods meeting their requirements. “It’s like Match.com for your neighborhood,” Ms. Straussman said. The workshop for real estate agents, “City Living: A Focus on the Pittsburgh Client,” was another phase of the initiative. It was developed by Ms. Straussman; Josette Fitzgibbons, coordinator of the Mainstreets and Elm Street programs; and Megan Stearman, Mainstreets development specialist. About 20 agents, most with little knowledge of the city, signed up. Under a special arrangement with the state Real Estate Commission, all received continuing education credits needed to maintain their licenses. The agents saw new construction on the Central North Side, in Fineview and at Summerset at Frick Park. They heard about the house-by-house revival of Friendship, the development spurt in East Liberty and Lawrenceville’s recent emergence as a hot housing market. They visited Riverview Park on the North Side, Pittsburgh Phillips K-5 on the South Side and Pittsburgh Brashear High School in Beechview. Sometimes, “neighborhood ambassadors” climbed aboard to talk about their communities and how civic groups augment the development work of city agencies. “You know, we had rave reviews from the ‘students,’ ” Ms. Deets said, noting most continuing education workshops for real estate agents are classroom sessions on such issues as tax assessment and foreclosures. Because the workshop was unusual, the Realtors Association had to persuade the Real Estate Commission to give the continuing education credits, Ms. Deets said. The participants did spend some time in a classroom, learning about tax abatement, other home buyer incentives and the Pittsburgh Public Schools. To address concerns about the quality of city schools, the URA scheduled presentations about city magnet programs, the district’s academic improvement efforts and the Pittsburgh Promise college scholarship program. To counter other concerns about urban living, the URA arranged for the group to meet a man who’s raising two teenage girls on the South Side Flats and a single woman who lives in Allegheny West. The URA plans to offer the workshop again in the spring. In the meantime, to track the success of last week’s program, the URA will send a thank-you gift to any participant who provides verification of a city home sale. Ellen Connelly, a Howard Hanna agent who works mostly in the city, said the tour will make her job easier. “I have an out-of-town client coming in. She’s looking at Sewickley. She’s looking at Fox Chapel. But she’s really focused on the city,” Ms. Connelly said.